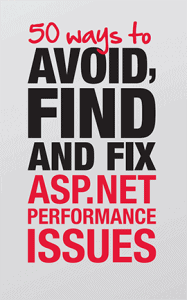 Download your free copy of 50 Ways to Avoid Find and Fix ASP.NET Performance Issues and see the tips and tricks that top developers from the .NET and SQL Server communities use to boost code and query performance in their applications. 50 tips from the .NET and SQL Server communities for boosting performance in your .NET application. Along with these great tips, arm yourself with ANTS Performance Profiler to isolate the problem that’s causing pain in your application. Narrow down the problem to your .NET code or SQL Server database in a single profiling session. Get line-level timings for slow code, and full execution plans for your queries, with expensive or slow operations highlighted for you automatically. Download your free 14 day trial now.